The product master set will contain 249 cards from across Magic 's entire history, a concept earlier seen in Eighth Edition. Each booster pack will contain 15 random cards from the master set. Cards from un-sets and the Reserved List are excluded. 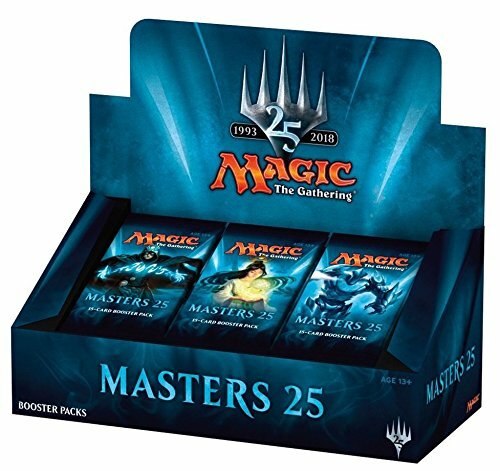 Nearly every card in Masters 25 features a watermark, representing its original expansion symbol. This treatment is even used for cards printed in Limited Edition (Alpha), Beta, and Unlimited. Un-watermarkable cards like planeswalker are excluded. The set features over 30 pieces of new Magic art! Each booster box is brand new factory sealed and contains 24 packs, each pack contains 15 random cards. If you have any questions about this product by Magic: the Gathering, contact us by completing and submitting the form below. If you are looking for a specif part number, please include it with your message.